Elizabeth (Libby) Shaw wants to be a doctor like her father. Her father has gone to London for several months and she sees this as an opportunity to go to medical school. Women aren’t allowed in medical school, so she dresses as a young man and uses the name Joseph Smart. She hopes to be an apprentice to a surgeon. While watching a public dissection she meets some other students and one of them, Archie, invites her to go to the pub with him and his friends. As she’s leaving, she notices a man she met two years ago, the artist Ibrahim Kent, and realizes he recognizes her. He follows her and agrees to keep her secret. Ziyaeddin Mirza, is a mid-eastern Prince in exile using the name Ibrahim Kent. He makes a living from his fabulous paintings. He lost part of his leg and is in pain quite a lot. His sister is still in his homeland and sends a letter to him through a trusted source. She wants him to stay in Scotland until the time is right to come home. Libby decides to move in with him, so she can study in her disguise. He tries to say no but gives in to her. He paints and she studies medicine as they fall in love. Libby sees how hard it is for him to walk and makes him a more functional prosthetic leg. Then comes the day he must return to his homeland. He gives Libby his house, so she can continue her studies. There is a lot more going on in this book that I will not spoil. Mystery to solve, Libby’s issues and wondering if he’ll ever return to Scotland. Don’t worry, there is a HEA! I hope you’ll read this wonderful book. Katharine Ashe is an automatic buy for me. 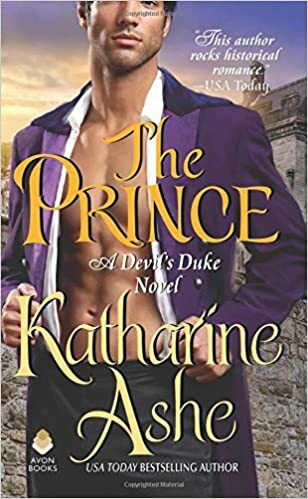 OMG – I thought The Duke was my favorite Katharine Ashe book and it was UNTIL I read The Prince! This is not your typical HR novel, it is fresh and original and while the trope of a woman dressing as a man is not new, this story is unique and completely mesmerizing! Once I started this book, I could not put it down. Ziyaeddin Mirza, exiled Prince of Tabir is hiding, he has assumed the identity of Ibrahim Kent, portrait artist and awaits the day he can return to his country and reclaim his birthright. Ziyaeddin is one of the most honorable and romantic heroes I have ever read – there is nothing about him that I would change. Not. One. Thing. Elizabeth “Libby” Shaw is the adopted daughter of Dr. Shaw, she met Ziyaeddin in the previous book and she became his secret obsession. Libby’s dream is to be a surgeon, she is brilliant, motivated, compassionate and unfortunately, a woman she also has an anxiety disorder (imagine Temperance Brennan from Bones and Adrian Monk have a love child – that is Libby) . To attend lectures and become an apprentice, she assumes the identity of Joseph Smart. Her father is leaving for a year in London and Libby will be staying in Scotland with her friend Alice, this is the perfect time for her to prove her worth as a surgeon. The disguise is going to be the only problem, coming and going as both Joseph and Libby is sure to cause some problems. So when she sees Ziyaeddin at a lecture and knows that he sees through her disguise, she hatches a plan – she asks him to paint pictures for her and sign them Joseph Smart – NO, she says she could live with him as Joseph, saying he is her patron – NO. He sends her on her way. Later he reconsiders and makes her an offer, she may live with him as Joseph and he will introduce her to Charles Bell on one condition – she sits for him once a week and lets him paint her. She agrees. Over the course of the next few weeks, she registers for classes, makes friends and Bell finds a surgeon to take her on as an apprentice. At her first sitting with Ziyaeddin, she asks many questions, but gets no answers. He avoids her, but he does her small kindnesses. He desires her, but knows they have no future – she has dreams and he has a destiny to fulfill. Little by little, he shares his past with her, he is the only person she feels completely comfortable with and she desires him. But he maintains a distance between them. When he tells her that there can be nothing between them. She insists on making a new prosthetic for him and after considerable badgering on her part, he agrees. But when he is in pain after the new prosthetic and she says he needs massage and offers to administer it – he refuses and flees to visit the Duke. She is lost without him, he is her anchor and without him, she begins to fall apart. When he returns, he is shocked and devotes himself to helping her recover. When they finally kiss, it is like a dam is broken, he tells her it is a mistake and will never happen again. She gets news that her friend Coira needs her and he offers to help. But she is still hurt by his rejection and decides to leave the house. When he learns that she has left and is not with Alice, he grows frantic and when he finds her, alone and raging with fever, he brings her home. When she recovers, he asks her to forgive him and their relationship takes a turn. When ugly rumors surface and Ziyaedinn’s life is in jeopardy – Libby realizes that she has been selfish and makes the ultimate sacrifice for the man she loves. He is awed by her and loves her, but he has a destiny to claim and she plays no part in it. This book was epic, it is well written, flows wonderfully, has amazing characters, heartbreak, secrets, sacrifices, steamy-ish love scenes and an incredible soulmate type love. While this book is the fourth in the Devil’s Duke series, it can absolutely be read as a stand alone title, as the connection to the previous books it very minimal. I cannot recommend this book enough, it is definitely one of my top picks for 2018 and has a permanent place on my keeper / read again shelf. I love Katharine Ashe’s books and I already can’t wait for the next book. This story is about Libby Shaw and she refuses to accept society’s rules. She is determined to become a member of Edinburgh’s all-male Royal College of Surgeons and has been dressing up like a man. She fools everyone but one man, who has never forgotten her lips. Ziyaeddin is an exiled prince, who was forced to leave home as a boy. When he first met Libby, he memorized by her. But when Libby asks his help to hide her identity from the world, but she has to sit for him to paint a portrait. I thought this book was very good.